Mom and Justin at his senior prom. 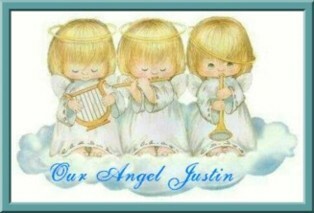 you are with us and we will all be together again soon. Happy Birthday Buck! If I ever need a smile, I think of the night you were born. 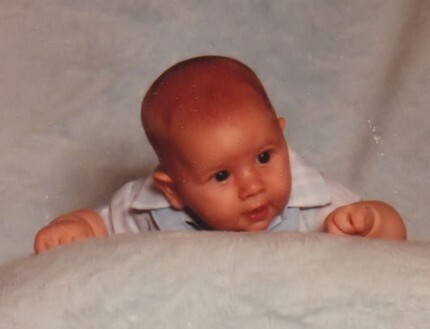 Man, was I a proud dad, it had to be the single most happiest day of my life, and as you got older and bigger, I grew more and more in love with you, my buddy, friend and pal. If I ever need a cry, I think of you not being here with me. But, God knows what is best for our lives. 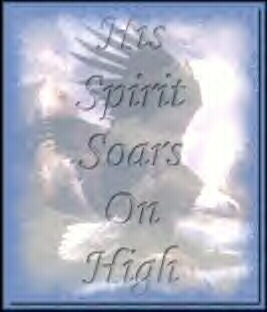 My heart is heavy, but I do praise the Lord for Ben and mom, I still have them. I have chose to celebrate what I have had, and what I have got. 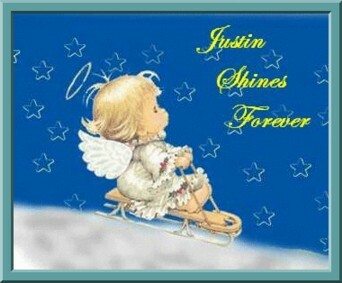 Thank you Justin, you have made us all better for knowing and loving you. P.S. I could do a book of stories of you. 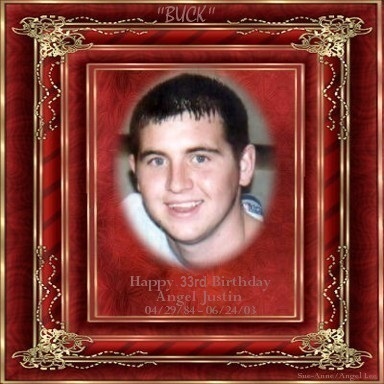 Happy Birthday Bub, I love and miss you so much. 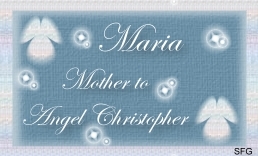 I know you are with me always. Who chose me from the start. 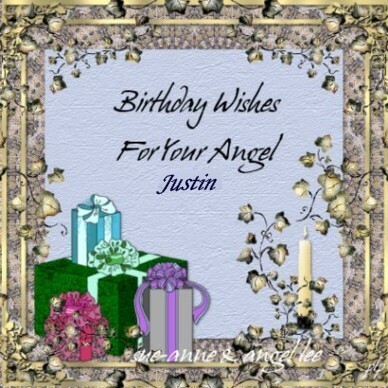 This special birthday gift for Angel Justin is from my friend Marie. 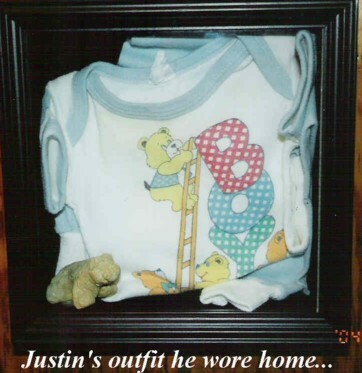 These are two beautiful and loving gifts to Angel Justin from my dear friend, Carol, mom to Angel Michael. 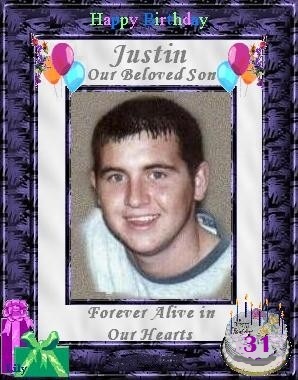 Justin you were born on the 49th anniversary of my dad, your great-grandfathers Heaven Day. You were so beautiful, I just wanted to go sit at his grave and tell him all about his great grandson. 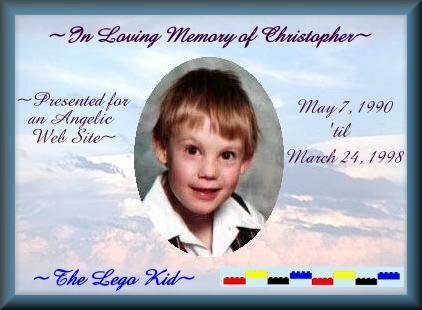 So my beloved grandson, while we will gather and celebrate your birthday here on earth you will be with the rest of the family helping your great grandfather celebrate his 70th Heaven Day. 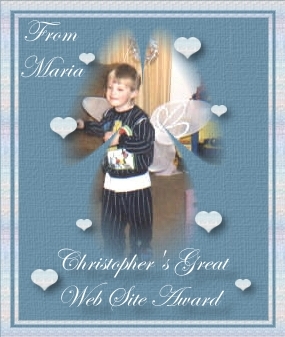 Tell dad Happy Heaven Day for me and Happy Birthday to my dear grandson whom I miss painfully and desperately. 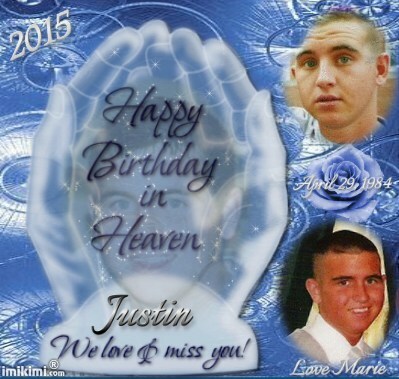 This beautiful image was made for Justin's Mom by one of Justin's Classmates, Cathy Adkins, for Justin's birthday. 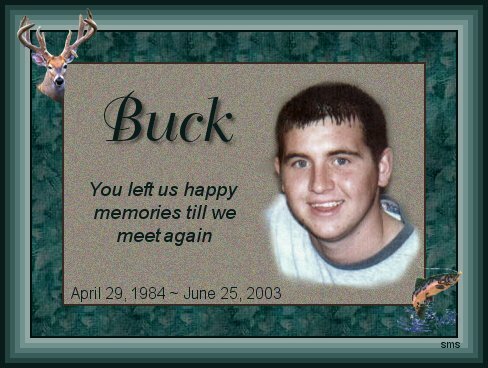 Buck- I'll never forget all the fun times we had together. You're such an amazing person. I am so lucky to have had a friend like you. I love and miss you more and more everyday. 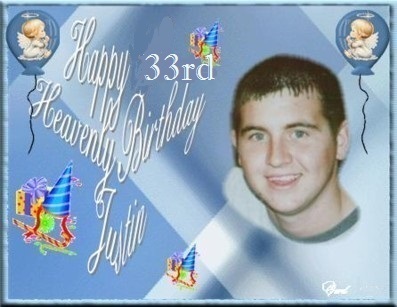 the birthdays that they spent with you and smile, remembering all the life you lived and the life you are living in heaven. 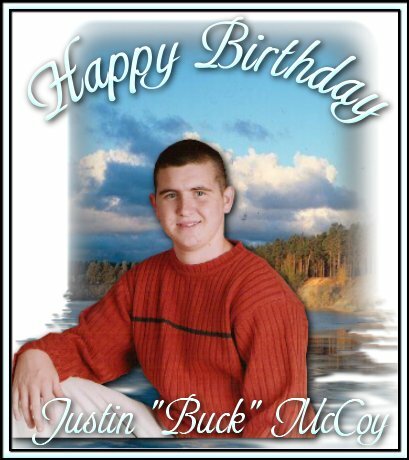 Happy 33rd Birthday Buck! Things aren't the same down here without you, but you'll always have a place in my heart. we miss you more and more. You will forever be in our hearts. Bucky, not a day goes by that we don't think about you, we'll never forget the great memories we have shared together. 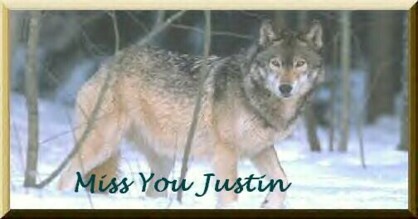 We love and miss you and can't wait to be with you again. Bucky, you truly were an angel here on earth. You were a good friend of mine and to so many others. Happy Birthday Bucky, I really miss seeing your smile especially whenever I need to, because you always did that for me. and shines down upon us to let us know they are happy. * Bucky, you're my shining star. Thank you for everything you taught me. I won't ever forget the memories that I had the pleasure of sharing with you. Bucky, I think about you every single day. Just keep thinkin about those "family reunion memories." I miss you so much and can't wait to meet you in Heaven someday. Love You! you're not here in body, you're still with me in spirit. I'll never forget you. You will always be in my heart. I could have never asked for a better friend! Happy Birthday to my favorite nephew. I love and miss you dearly. Happy Birthday Bucky! 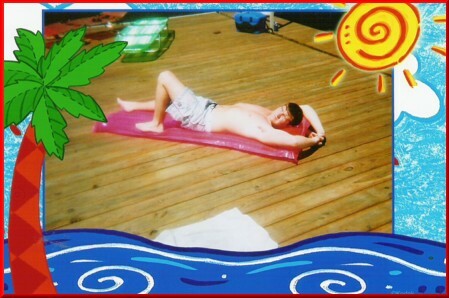 We love and miss you so much, wish you were here. and I will cherish the times and memories we shared. 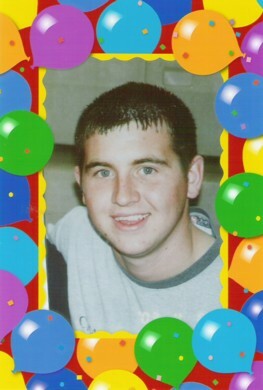 Happy 33rd Birthday Bucky *How does it feel to get to dance for Jesus? (she chose this because of the lyrics in "I Can Only Imagine"
so Happy Birthday Babe. 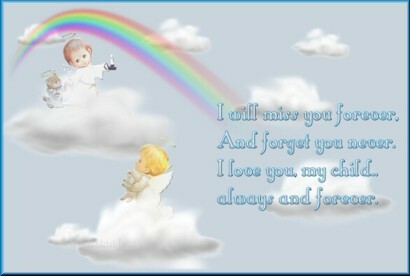 You'll always be in my heart...forever. Our new little granddaughter's name is Cali Nicole McCoy, and she was born on December 19, 2012. She is an absolute angel. On the right is a picture of Justin as a baby, and on the left is one of Cali in the bathtub so you can see how much they look alike. 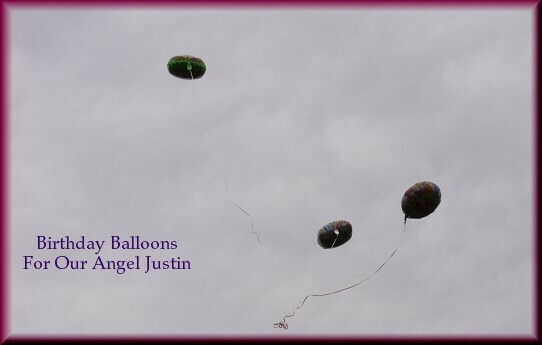 This a picture of Cali and Justin's mom, Missy, wishing Justin a Happy 30th Birthday! 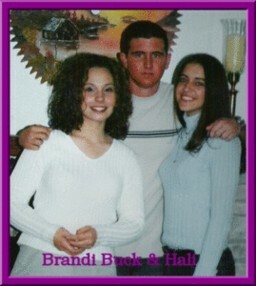 Justin's brother Ben, his wife Marlena and Cali. Smelling your clothes, just to catch a scent of you. Listening to a song you once listened to. Calling a person who was a friend to you. Looking at pictures of only you. 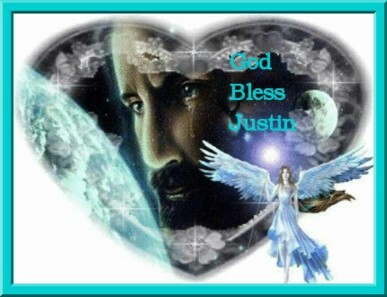 Thanking God for blessing us with you. to put at the park for his dedication ceremony. And your smile it seems so real. When I know that you're so near. I still have so much to give. And to once more see your smile. So I'll know that you are near. When I open up His door. Were the happiest I'll ever know. And no longer shall I grieve. 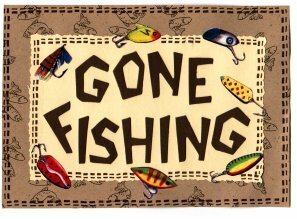 And if I have to travel far. he passed two months later. His brother Ben is looking on...big sigh He is smiling so pretty here. 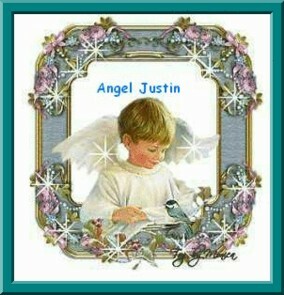 Looking through your site, your ANGEL Justin seemed to be the laugh of the party. Always had a smile on his face, friends that loved him. THEY ARE WONDERFUL MEMORIES TO HAVE.